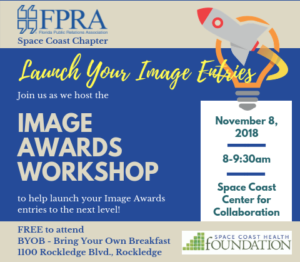 Interested in submitting for the local Image Awards? Join us for a fully involved workshop, featuring experienced Golden Image Award Winning Instructors! We’ll break off into small groups with participants to go through the process, what qualifies for Image and brainstorm ideas to submit! This event is free to attend and BYOB – Bring Your Own Breakfast. Thank you to our generous location sponsor the Space Coast Health Foundation!